So this is pretty major for me. These trousers are a massive departure from an aesthetic that I've been pretty dedicated to for the best part of a decade. The casual retro/Rockabilly-lite tip I've been on may not have always been super evident in all of my personal sewing projects, but they were the vibes I have most identified with and been inspired by for agessss. However, last year I felt something shift and I became less interested in those looks. But because I was pregnant and my body was changing shape and size, I had to put any real experimenting into my new stylistic inspiration on hold. I'm a big fan of the designer Rae Hoekstra, AKA Made by Rae, and I'd been sniffing around her Luna pants pattern almost since she released it. I couldn't see myself wearing them, but I'd often suggest the pattern to students in my sewing classes if they were looking for an easy-ish trousers pattern to make. 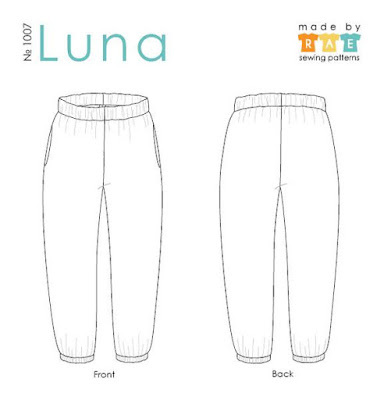 Then, when I was pregnant, a friend lent me a big bag of various maternity trousers and jeans, which contained a pair very similar in style to the Luna pants. 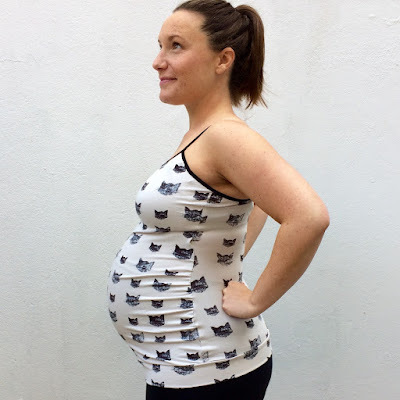 When I first saw them I put them straight back in the bag and mentally labelled them 'not me', but in the last few months of my pregnancy I ended up wearing them almost constantly. So having identified during #MMMay17 that light-weight trousers would be a welcome addition to my wardrobe, it was time to go Luna exploring... (sorry, too obvious?!). The Luna pants pattern was a welcome respite from my trouser fitting woes. Yet, as per Rae's recommendation, I still made a toile (muslin) to check the fit before chopping into my precious fabric. Partly because the fabric has sold out so I couldn't buy any more if I messed it up, and partly because I've decided that sewing time is too rare and precious to spend it making garments that don't fit well and won't get lots of use. My main concern was getting a fit that didn't look too baggy. I prefer the look of the green pair pictured below which seem to have a similar fit to the maternity pair I borrowed, as opposed to the yellow version that you can see here. This pattern has about 4"-5" of ease through the hips, which seems like a lot to me, so I decided to go down a size from what my measurements would suggest to should cut (which Rae suggest if you're using a loosely woven fabric). (BTW, there is also a series of extra-detailed blog posts from the Luna pantsalong, if you require a little extra hand-holding for this make). It turned out to be a good call and I'm really pleased that I went for the Small, rather than the Medium, as the fit was pretty much exactly what I was hoping for. The only changes I then had to make to the pattern were to shorten the leg length by about 4cm, and to slash-and-flare through the back rise to add 1cm as it felt a teensy bit tight through the seat. Although I was on a self-imposed fabric diet after my then-recent move (nothing like packing up to move house to force you to acknowledge how much fabric you own! 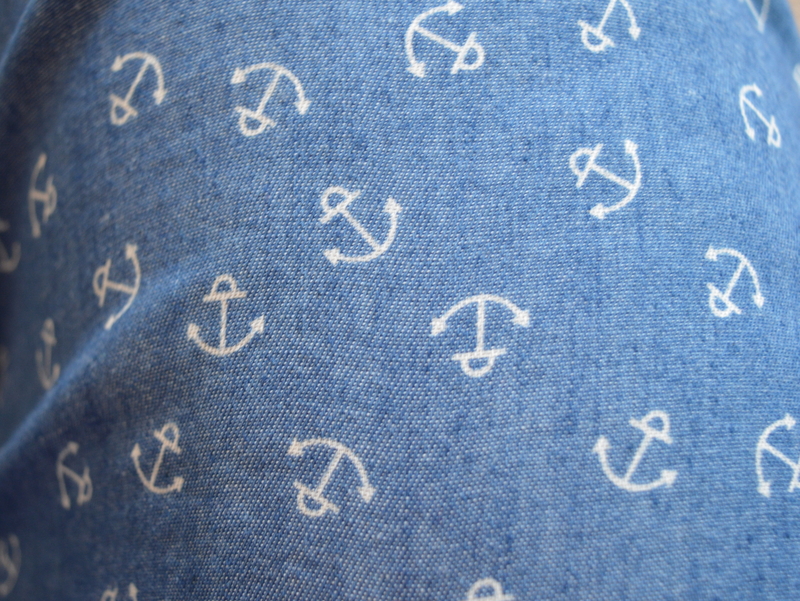 ), I treated myself to a couple of metres of this light-weight washed anchor print denim from the Village Haberdashery on my last day teaching there before going on maternity leave. Pre-washing revealed its super-soft and slightly drape-y nature, so I had a hunch that it'd be a great match with this pattern. 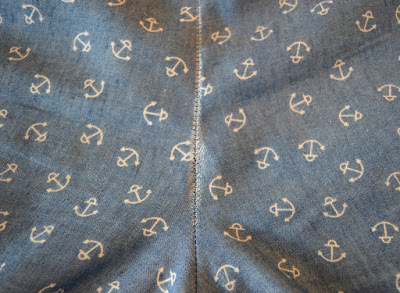 I wish I could link to the fabric, but sadly it's not on their website so I assume they have sold out. I put these on as soon as I finished making them and then wore them for three days on the trot before I accepted they should have a wash. The fit was exactly what I hoped for, and they were pleasingly airy during the roasting hot weather we had last week. 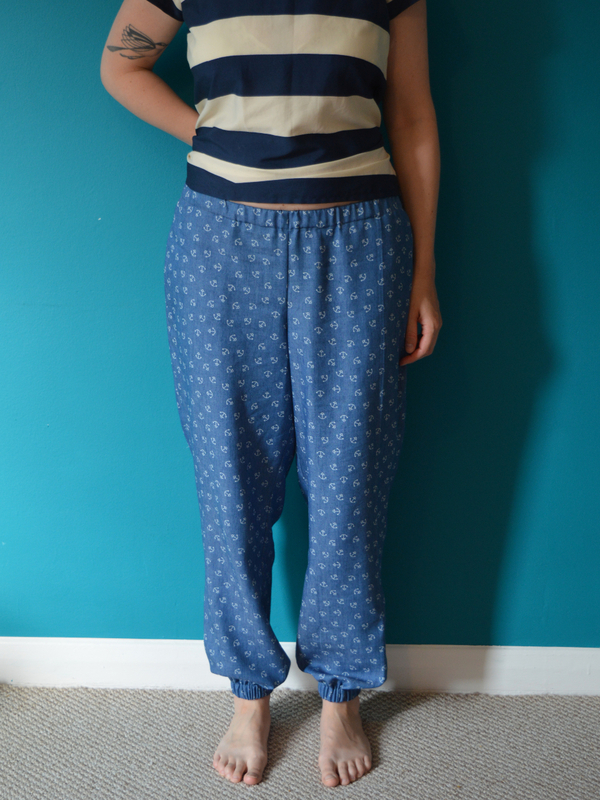 The only thing that felt less than pyjamary was the elasticated ankles. 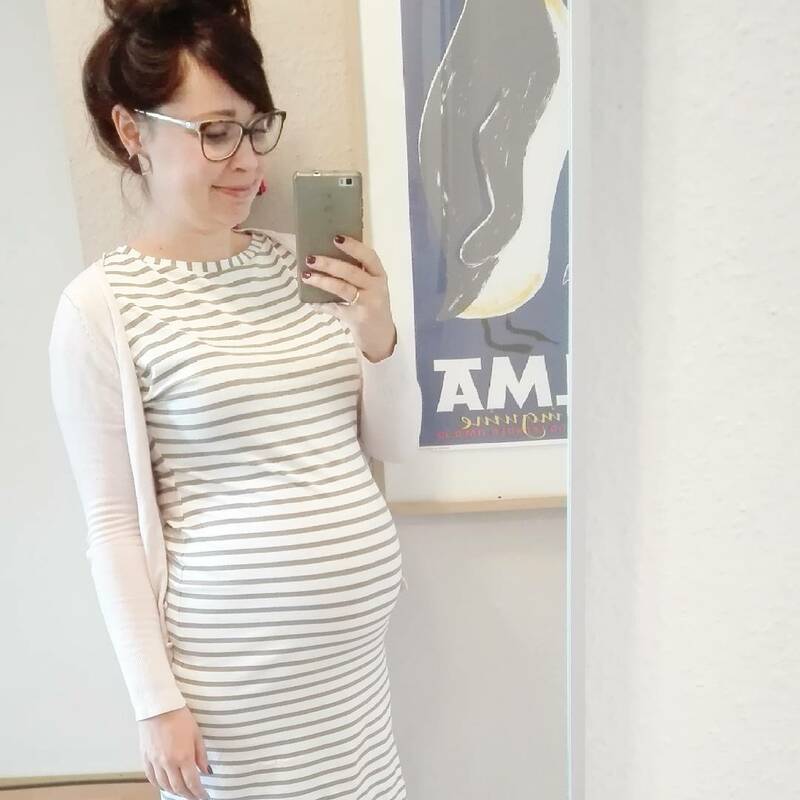 Not being used to this style, and not having worn the maternity pair I borrowed for eight months, I felt really conscious of them to start with. However, sensory adaptation did its thing and I didn't notice them at all after an hour or so. What is breaking my heart is that the loose weave has resulted in the fabric coming apart a bit at a couple of stress points on the rise. There's a bit on the front but it's more noticeable on the back (see above and below). These appeared after just one wear, and I'm not sure what, if anything, I can do about it now, or how I could prevent that in the future. Thoughts most welcome. Fabric: I can't remember!!! I'm guessing £16 for 2m? 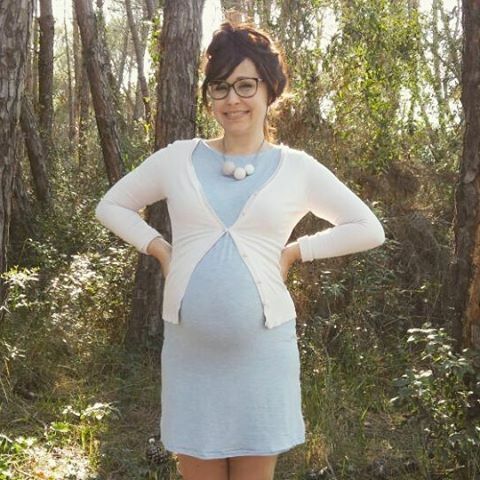 Brighton belle, Zoe B, looks so divine in the cutest maternity make ever, doesn't she?! She also made her little babe some matching kitty leggings from the leftover fabric. Here's lovely Vanessa McWilliams rocking a Cordelia camisole and a beautiful 7-month bump. I love that sketchy-effect fabric print. Maider and I were both heavily pregnant last summer, however she lives in Spain so was probably feeling even hotter than I was. I'm so pleased that she found the time and energy to make this fabulous anchor (yes, anchor!) print Cordelia. 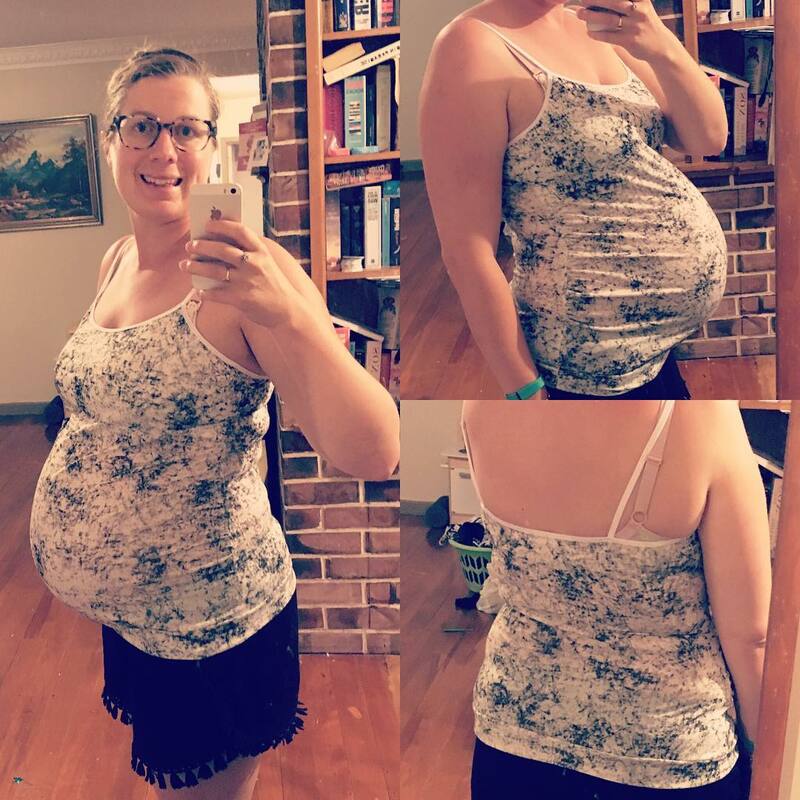 Such a lovely bump, too! 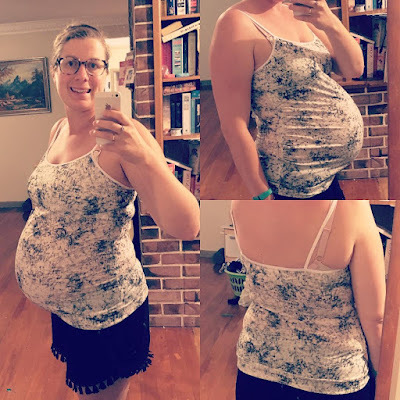 Michelle from House of White shows how useful the Cordelia camisole can be for extending the wearability of non-maternity clothing. During #MMMay17 she layered hers underneath this incredible jacket that she drafted herself. 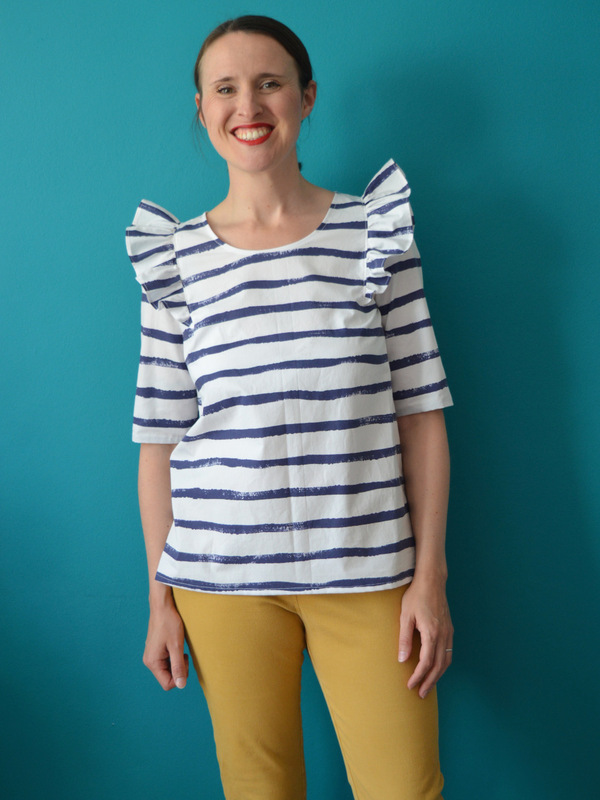 Mirjam is an absolute sewing ninja and a seriously creative soul. Her refashioning skills are second to none (she won the Refashioners 2015 Get Shirty community competition!) and she even makes shoes. 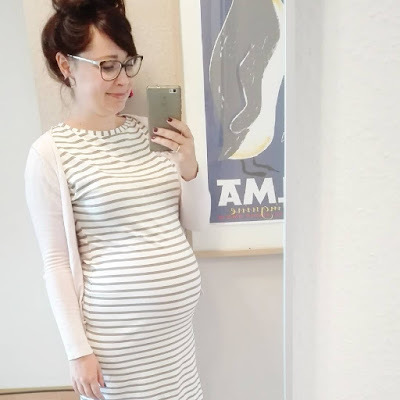 She made some fabulous garments during her pregnancy last year, including this long-sleeved Dolores maternity dress. Hattie has got to be the most prolific maternity sewer that there's ever been! Check out her Instagram account to see the full extent of her epic clothing output. I have to include two pictures of her in this maternity makes round up because she just looks too damn lovely! Hattie already has one daughter, with a second on the way. My hair never looked that good even before I had kids... As I say, too lovely. 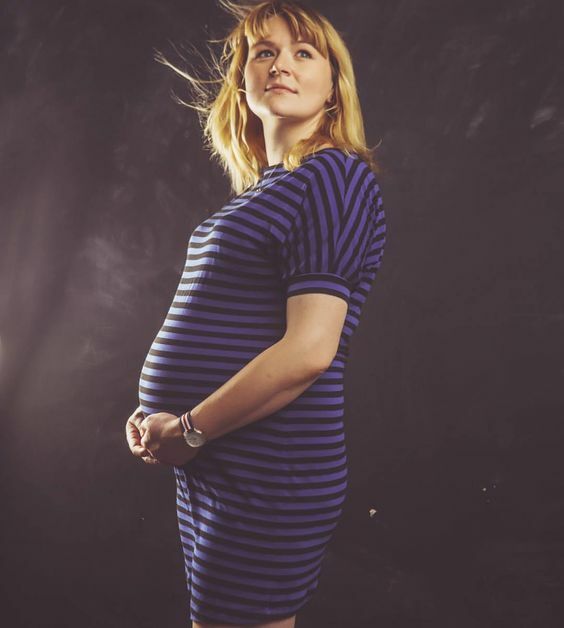 Speaking of epic, check out this stunning picture of Von in her short-sleeved Dolores maternity dress! That side-seam stripe-matching should win some sort of prize as well. My last blog post was pretty lengthy, so in the name of equilibrium, this one's going to be a bit shorter. 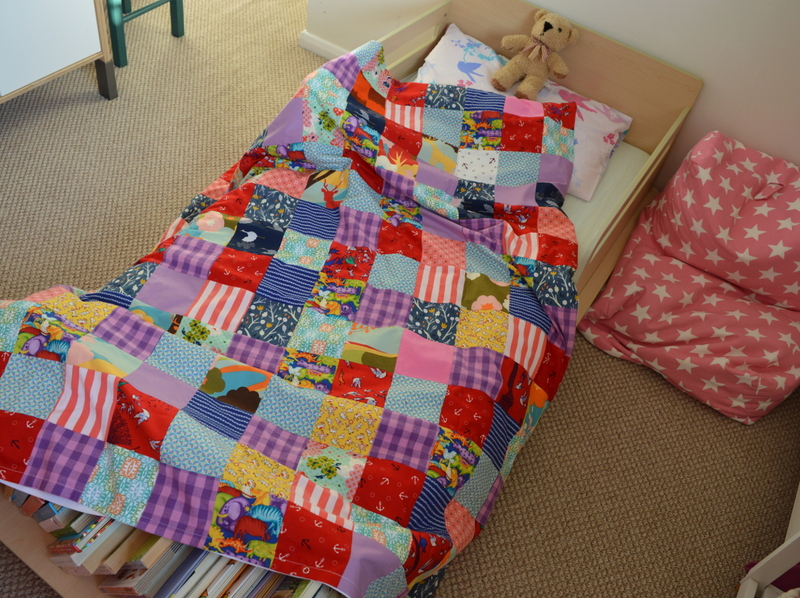 I'm pleased to finally share with you a patchwork duvet cover that I made for Dolores that (I'm sure won't surprise you) took AGES. Of course it took ages to prepare and sew, but it also took ages because I decided to make it not long before I was due to give birth to Frankie, so it ended up being put on hold for yonks whilst we went through the fire-fighting early days (weeks, months) of life with a new baby. The seed of the idea to make the duvet cover actually came from an exhibition I visited in 2015 called 'Fashion on the Ration' at the Imperial War Museum, London. Mrs M has written an excellent explanation of it here if you're interested to know more. 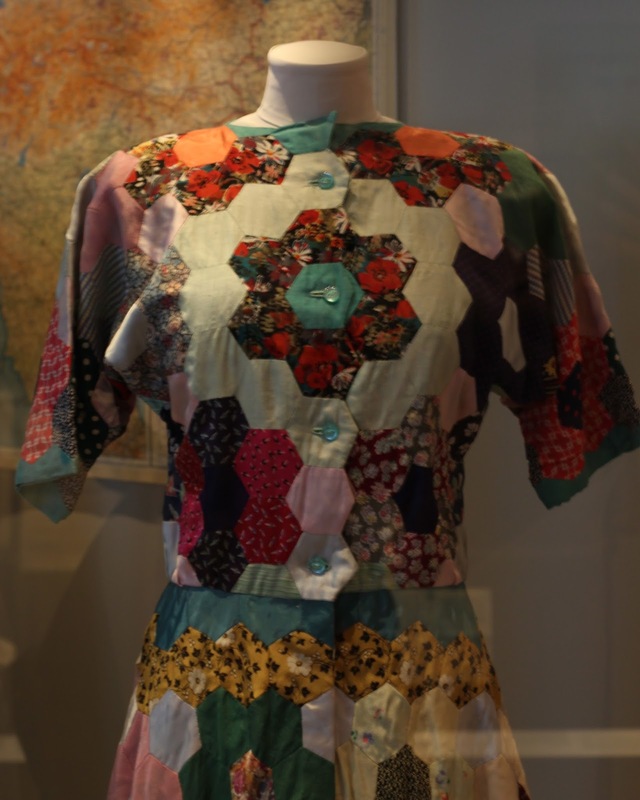 During the Second World War in the UK, clothing and fabric were rationed, scarce and expensive, so a woman had made the patchwork house dress pictured above during the second world war from scraps of fabric she already had. I didn't linger on the dress for long during the exhibition, but afterwards I found myself thinking back on it, and the circumstances surrounding its creation. A year later I found myself in a bit of a pickle. 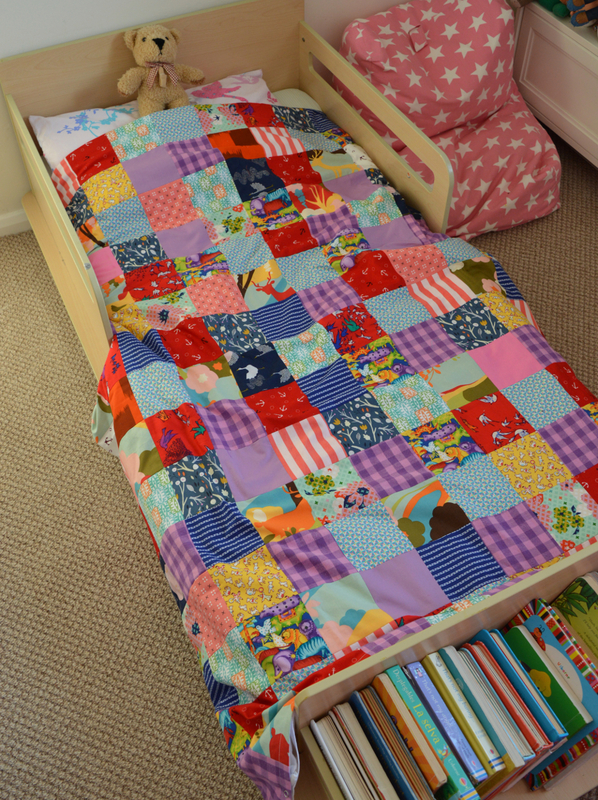 My tiny sewing space was drowning in scraps and small pieces of lovely fabric that I didn't want to put in the textile recycling, and I thought a fair bit about how to use them up in fun and useful projects. A few months after that, Dolores started potty training and it became apparent that we needed another set of bed linen to cope with the inevitable accidents. 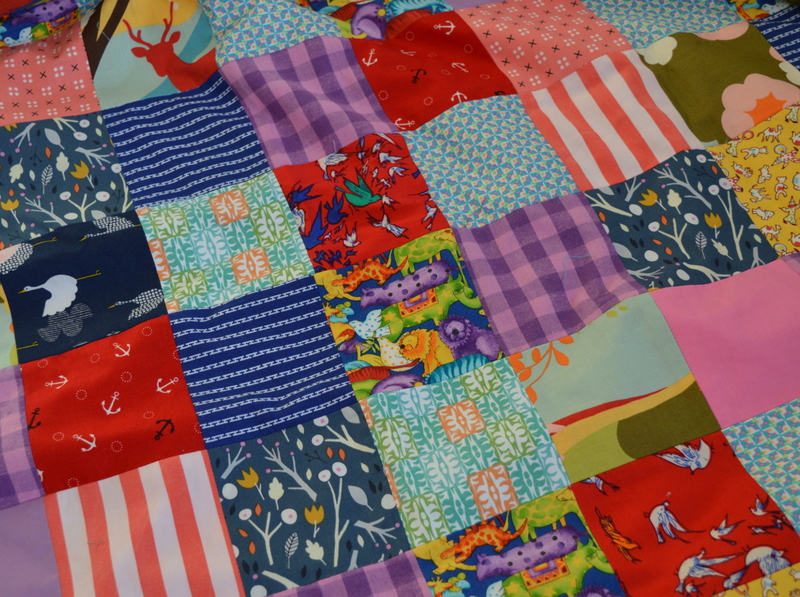 There was nothing suitable in my fabric stash, then an equation began to emerge: I needed a big piece of pretty fabric, I had lots of small pieces of pretty fabric, could I make the small pieces of pretty fabric into one big piece of pretty fabric, like the house dress's creator had done? Most of the fabric is quilting-weight ish cotton that was largely either leftovers from my previous garment making projects, or the small and weirdly-shaped flotsam and jetsam from sample work I'd completed for the window displays for the Village Haberdashery. I used some plain white shirting from my stash for the reverse, and finished the bottom edges with some bias binding, which also reinforced where the press studs then went. I didn't bother to finish the raw edge of the patchwork inside, and after a several rounds of laundering, all is well. Looking at these pictures brings back a memory of sitting in my pants cutting out the hundreds of squares with my blunt rotary cutter in last summer's heat with my enormous, awkward belly getting in the way! At a couple of points during the project, I wondered if I should add some wadding and extra rows of stitching and call it a quilt instead. 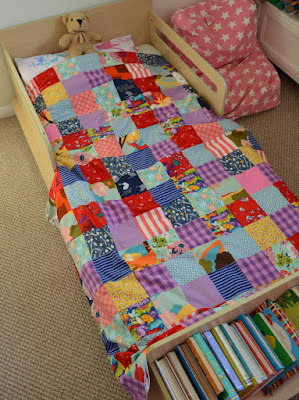 Then all that work could be called an 'heirloom', rather than just a duvet cover, right?! But that would have failed to meet my aim of creating something easily washable. So instead, like the creator of the house dress, I spent many woman-hours creating something that is everyday-useful, and also quite special. 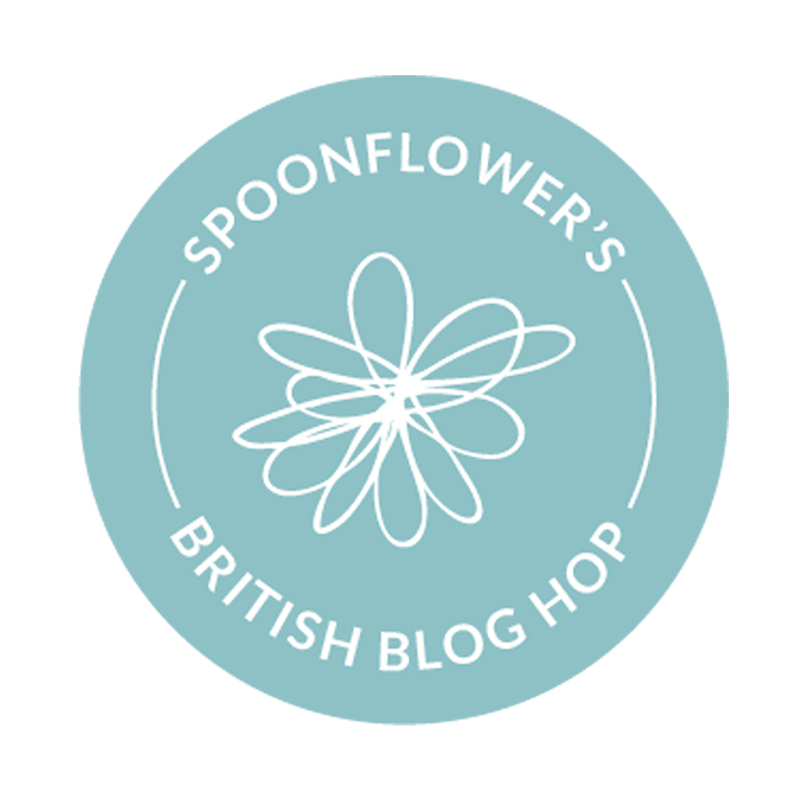 So this project was instigated by an invitation to take part in Spoonflower's British blog hop. They want to promote the fact that they have a second factory which is based in Berlin. This means, for British sewers at least, no nasty surprise taxes or import duties, plus quicker delivery times. 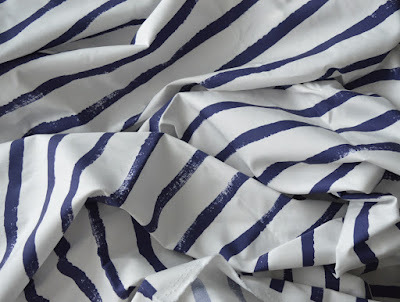 I was offered my choice of fabric to make a garment from and blog about it. Seeing as I am very much in the business of making garments and blogging about them, I told them to count me IN. 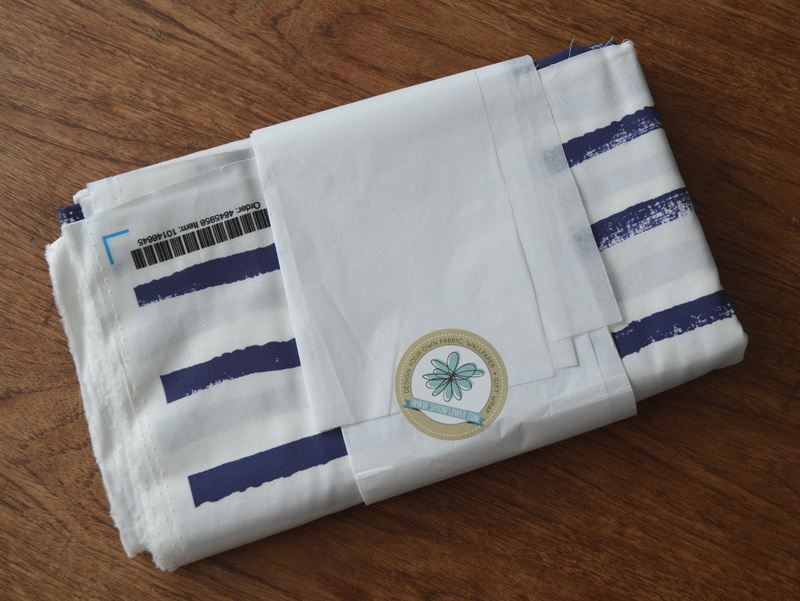 As you may know, Spoonflower offer a fabric printing service where you can either design your own print or choose one from their catalogue, and get it printed on one of their base cloths. Having never tried a fabric printing service, I was interested in trying out designing my own print. But my primary aim with this project was by the end to have a garment that was very 'me' and I would love wearing. So I had a think about the inspiration I've collated over years on my good old Pinterest boards, and thought that a striped Breton type design would most fit with my style and be most likely to be worn. 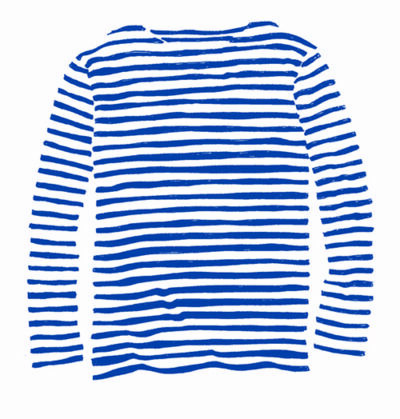 I wondered if I could create a kind of hand-drawn striped design, as a spin on the classic Breton stripes, similar to the images above. However, then I fell down the Spoonflower rabbit hole. Turns out there are hundreds of thousands of AMAZING designs already on there to choose from. For a number of days I got completely obsessed by typing in a word into their search box (cacti! flamingos! sketchy! Mexican!) and seeing the many many different interpretations on each theme. 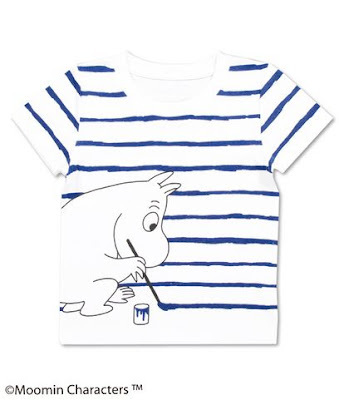 I was really into the work of one particular illustrator/designer who annoyingly I can't remember the name of now, but at the last minute I pulled myself back and remembered my wearable-spin-on-a-striped-Breton plan. After typing in 'striped' and searching through the results I found this print. It was almost exactly what I had in mind, and no doubt much better than what I could have rustled up myself in the limited time frame, so I plumbed for that one. Having found the print design, next I had to pick the fabric type. My first thoughts were to go for a knit, because I seem to almost always sew with and wear knits these days. 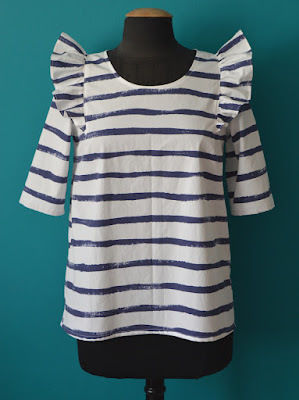 But then I had a sudden epiphany: this was a chance to make something more special than a t-shirt variation, and that I could pick a fabric to make the La Brune sewing pattern I had just bought (more on that in a bit), which required something woven but I had been drawing a blank on. I was a little disappointed with Spoonflower's options for finer-weight wovens. I guess I was looking for something natural with some drape, or a lawn perhaps. But my contact at Spoonflower was helpful in guiding me to this cotton poplin that would probably be fairly suitable for the pattern I intended to make. I think this fact deserves analysing in its own blog post at some point, but recently I've become obsessed with French-speaking sewing blogs, Instgramers and sewing pattern designers. Miraculously, this has coincided with Pat (Mr So Zo) teaching himself to speak and read French (he's going to train to be a French and Spanish teacher next year). 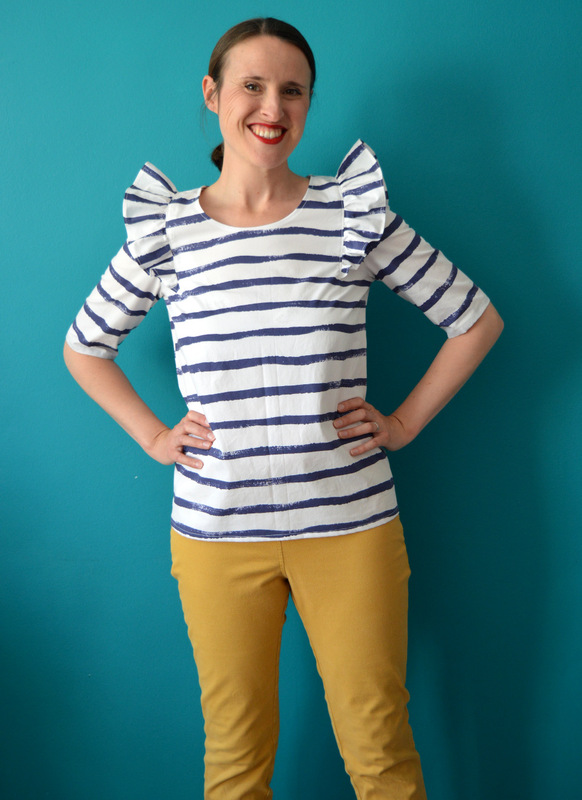 Anyways, I bought this PDF pattern pictured below, named La Brune, by Delphine et Morissette. 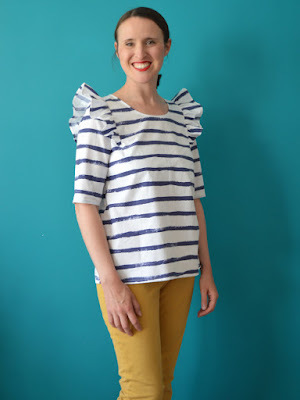 Thank goodness for Pat's French assistance because the method of purchasing her patterns involves messaging via a contact form and then completing the transaction via email, rather than through the predictable online shop format. For all I know she speaks perfect English, however I thought it was only polite to attempt to communicate in French. I must admit, considering how gorgeous and flawless her website, photography and garment designs are, I was surprised by the PDF I received. The instructions were a very basic Word type document with no step-by-step illustrations or photos. In fact, the construction steps weren't even numbered and, even if French was your native language, you'd have to have quite a lot of sewing experience under your belt before you tackled this pattern. 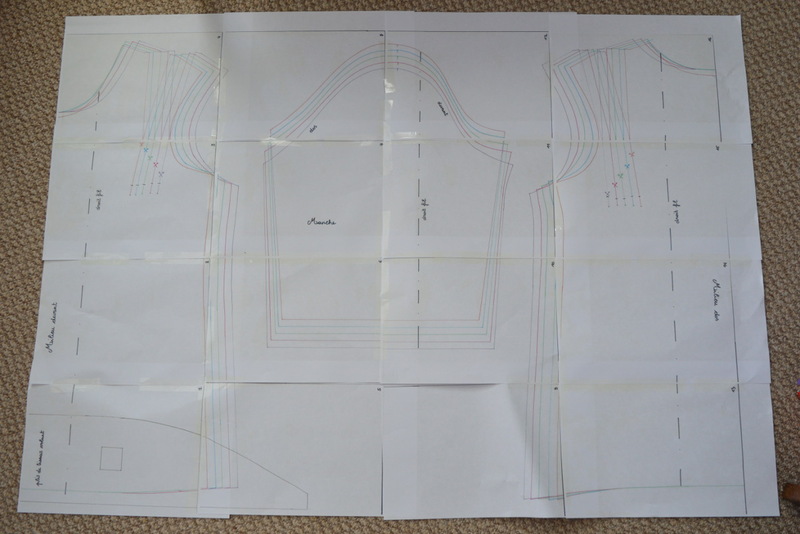 For example, the pattern advises to apply bias tape to the neckline, with pretty much no more detail than that. So you'd have to have worked with bias tape previously, or be up for learning quick smart, before knowing how to finish the neckline. Pat and I translated hard and scratched our heads for some time over a few of the steps, but although I don't think the instructions were as clear as they could have been, it made sense to me once I had the pattern pieces cut out in front of me. The pattern itself (pictured above) had not been digitised, and with no clear borders it was tricky to tape together. I'm not dissing this pattern, or the work of the designer, but I'm trying to make clear what you'll get if you buy this pattern. I think that us sewers/sewists have developed certain expectations of PDF patterns, even from the most kitchen-table based pattern design outfit (like mine! ), and we've become used to having our hands held through each step of the pattern prep and garment sewing processes. But equally, being able to make a nice, wearable garment from a pattern that makes you work harder is a great feeling. A 1cm seam allowance had been included to the pattern pieces, however I would have liked a few more notches to help put the pieces together, particularly on the sleeve head. I found that my measurements spanned two sizes, so I graded between the 38 for the top part to a 40 at the hips. I ended up taking that extra in again so in the future I'd make a straight size 38. 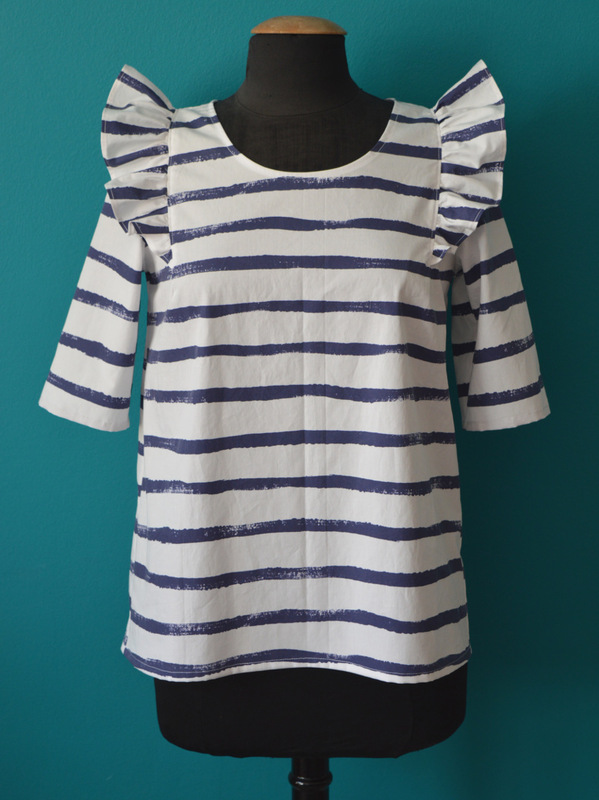 Before cutting the pattern I also compared the pieces to the Grainline scout tee so I could be certain that it'd fit me. 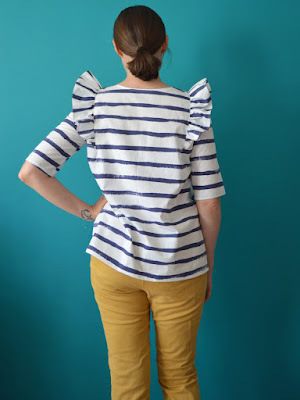 Having done a Google image search to check out other people's versions of this pattern, I decided to rein the volants, sorry ruffles, in a bit. I think I shaved off about 2.5cm at their widest so hopefully they don't look too much like wings, but I think I could have taken off a bit more considering the stiffness of my fabric. The shoulder line was a bit too angled for me, so I straightened that out a touch. I also widened the neckline slightly to make getting it on and off a bit easier (this blouse has no fastenings so needs to be pulled on and off over the head) and I reshaped the neckline to a more pleasing scoop, which I'm really happy with. The final pattern mod I made was to the sleeves. 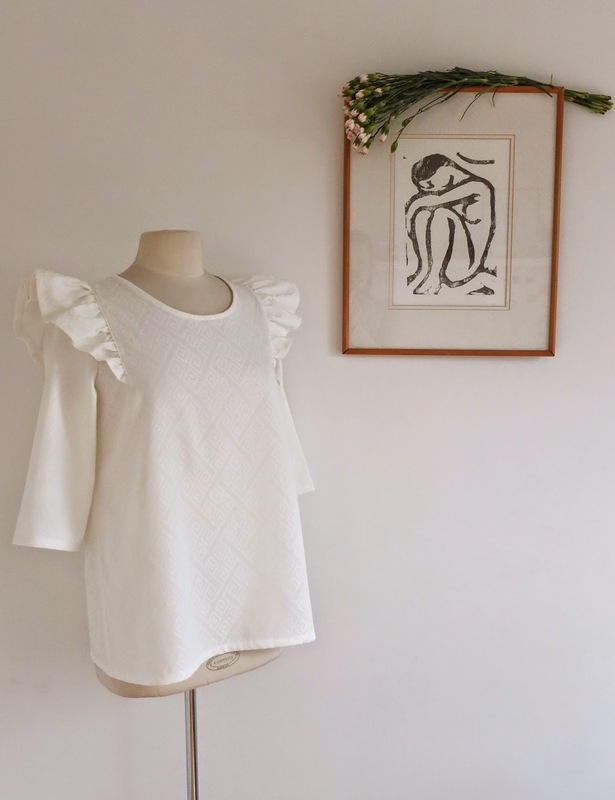 The original pattern design has 3/4 length sleeves, but when I tried it on, they felt too restrictive around my elbows so I shortened them to this half-sleeve length. Well, making this blouse was a real experience, I'm so grateful that I got the chance and the push to do so. Choosing my dream fabric print was fantastic, and also created quite a lot of pressure to get this garment right (particularly after my recent FAIL). I didn't have time to make a toile/muslin, so I had to avoid and/or iron out any issues with lots of measuring before choosing my size and trying it on multiple times throughout the construction process and addressing each necessary tweak. Having put the work in to figuring out the construction method, and in to getting it to fit nicely, I definitely intend to use this pattern again. On top of the changes I listed above, I'll also extend the bust dart so that it comes within vague orbit of my bust point (it's in a different galaxy at the moment), and I'll widen the bottom of the sleeves so I can make a 3/4 length sleeve version that feels nice to wear. Would I order from Spoonflower again? Possibly. There are so many seriously incredible print designs on that site, and I'd like to get my hands on a swatch book to see what the other base fabrics are like. I would be tempted to order something again for a special project, but it would have to be a project that I had time to toile beforehand so that I could enjoy the construction process, rather than it being a bit of a white knuckle ride! My goodness, where did that go?! How comes it's June now? For me, the month went by in a sleep-deprived blur. Plus, I think I'm feeling a bit cheated because I spent the first two weeks of May ill with flu. Like, properly should-have-been-in-bed-the-whole-time-ill with flu. However, I managed to stick to my pledge (apart from wearing my husband's fleecy, not-me-made dressing gown for a lot of those two weeks for which I do not apologise) by wearing me-made pyjamas, comfy leggings and sweatshirts. When I finally returned to vague health, I was able to continue to carry out my pledge, but some holes in my current me-made selection definitely became apparent. As I mentioned in my pledge post, I chose not to document my challenge with daily photos this year, although I did plan to take more than the lonely few images that I got during the month! I'm really pleased that I didn't put pressure on myself to take those daily images, but I do feel sad not to have that collection of photos to look back on, as I have from all previous challenges. I have very few hot weather items. I didn't have many to begin with, but I got rid of a lot during a big clothing clear out that I had just before May, as I didn't want my wardrobe clogged up with things that no longer feel 'me' stylistically. I have even fewer (i.e. pretty much no) warm weather items that are suitable for breastfeeding. 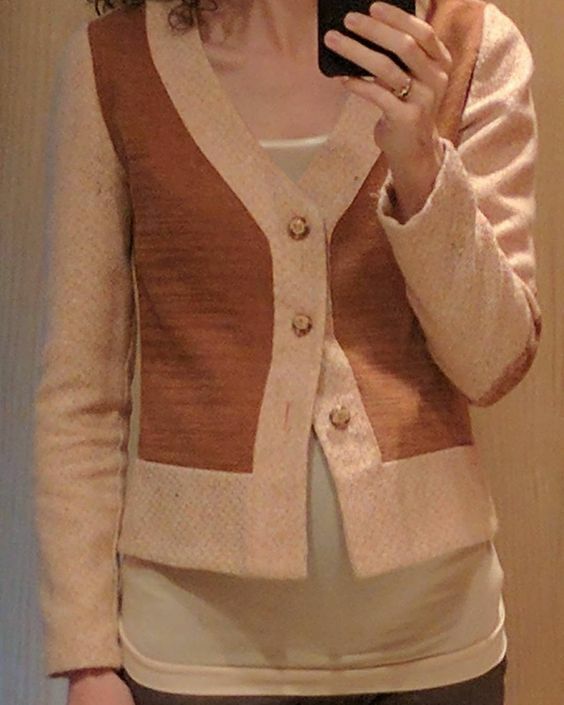 My breastfeeding-friendly outfits usually consist of a separates with a vest under the top so I can pull the top up without exposing my belly. But the weather we've had recently has been too warm to wear more than one layer. As a quick fix I shortened the sleeves on my cheetah print Agnes breastfeeding top, but I need to whip up another so I have at least one more option for daytime, out-and-about breastfeeding with dignity! I really missed my secondhand RTW jeggings. I love the slim-legged silhouette when I'm wearing looser or boxy-shaped tops, and although my black denim ultimate trousers are pretty slim legged, the denim is too thick for warm weather. 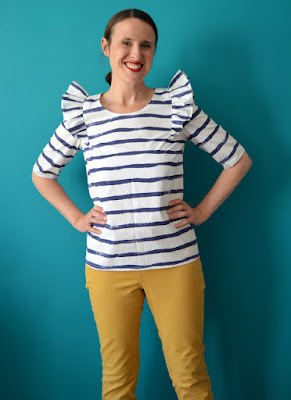 I've already taken the bold step of cutting up the RTW jeggings (they were really ratty anyway) and made a pattern from them, so watch this space for how that turns out. It's time to try some different style trousers. 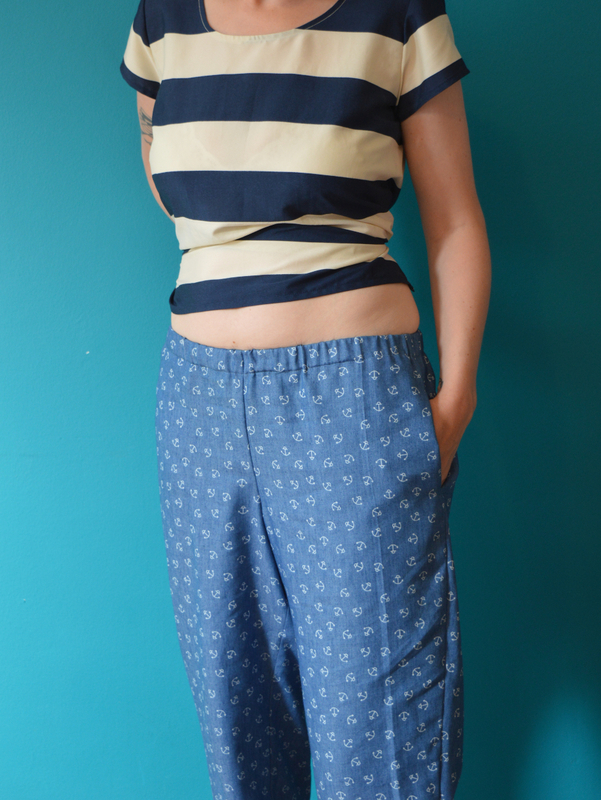 Although I have a number of great me-made skirts (all knee-length and knit), I much prefer wearing trousers and jeans. The latter also suit my current playground-and-playgroup-and-no-time-to-shave-my-legs-anyway lifestyle better anyhow. 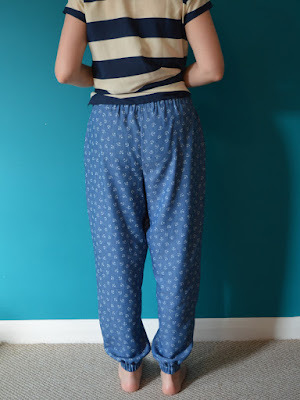 I'm feeling pretty restricted by only owning two pairs of me-made trousers which are both denim and therefore suitable for cooler weather, so I'm going to have to step out of my slim-legged jeans and jeggings comfort zone and try some patterns that are suitable for thinner fabrics. 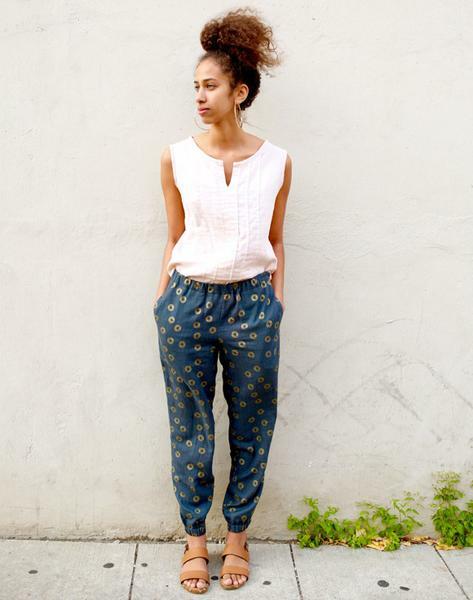 I've been eyeing up both the Made By Rae Luna pants and the Named Clothing Alexandria peg trousers. #Eek. 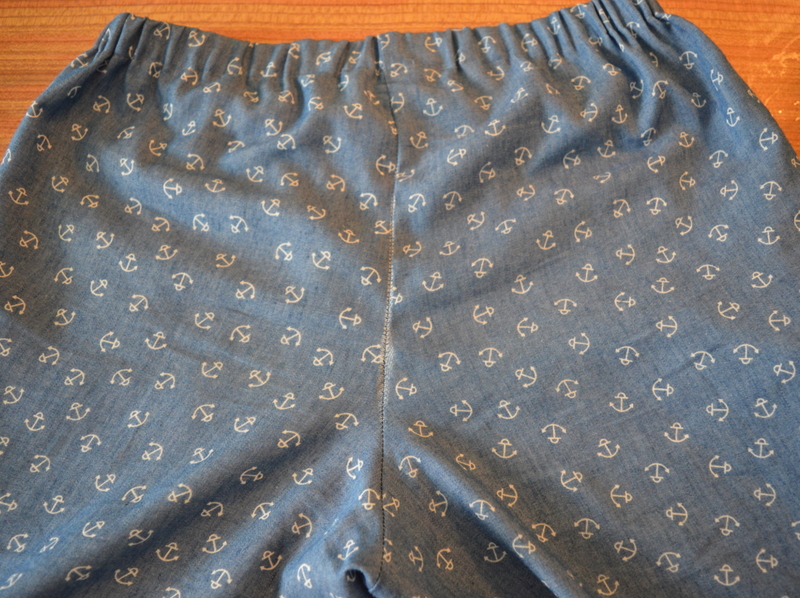 For even warmer weather, I think some shorts are going to be useful. I'd like to make some pairs for being in public (I've got the Deer and Doe Chataigne pattern, and I'm tempted to revisit the Pattern Runway Sweet shorts pattern), plus some for knocking about the house in (the free Purl Soho City shorts pattern perhaps?). My pairs of denim ultimate trousers really aren't that bad. I've worn them loads, and even though the fit isn't perfect, I doubt anyone is concerning themselves with my under-bum wrinkles! I'm not sure I can muster up the will to try to correct the fit flaws of that pattern right now though, so I'll probably move on to trying another denim-appropriate trouser/jeans pattern closer to the autumn. If you challenged yourself during May, how was it for you? What did you discover about your me-mades, your creativity, or even about yourself? If you've written a blog post about it, please leave me the link so I can go and check it out.